Permanently delete files and wipe free space. Is there a better alternative to Advanced Data Shredder? Is Advanced Data Shredder really the best app in Security category? Will Advanced Data Shredder work good on macOS 10.13.4? 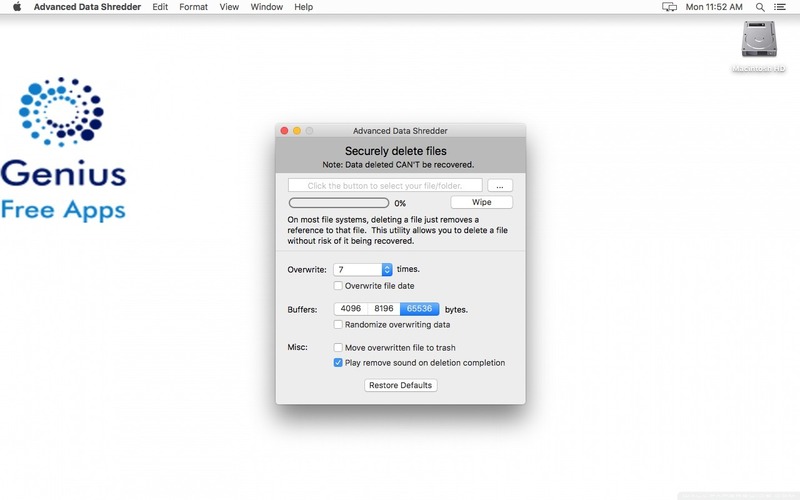 Advanced Data Shredder is one of the best data shredders available for macOS, and it is now free. You can delete your files without the ability to recover them, using various shredding algorithms, including DoD or Guttman. The app is also able to wipe your free space, in order to avoid recovery of any data previously deleted. Advanced Data Shredder needs a rating. Be the first to rate this app and get the discussion started!